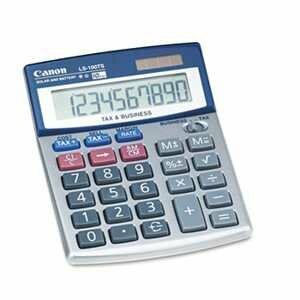 Canon 5936A028AA LS-100TS Portable Business Calculator 10-Digit LCD by CNM5936A028AA at FloType. MPN: CNM5936A028AA. Hurry! Limited time offer. Offer valid only while supplies last. Features business and sales calculations. With solar and battery power capabilities, it gets the job done no matter what the lighting conditions. Features business and sales calculations. With solar and battery power capabilities, it gets the job done no matter what the lighting conditions. Auto power off feature. Power Source(s): Battery; Solar; Display Notation: Numeric; Number of Display Digits: 10; Memory: 3-Key. If you have any questions about this product by CNM5936A028AA, contact us by completing and submitting the form below. If you are looking for a specif part number, please include it with your message.